To convert PRN to JPG and set page orientation, firstly, you need a document converter which is able to convert PRN to JPG and supports page orientation setting. If you are a Windows user, you can try VeryPDF PCL Converter. VeryPDF PCL Converter is a stand-alone application. You can download it from the webpage of VeryPDF PCL Converter. 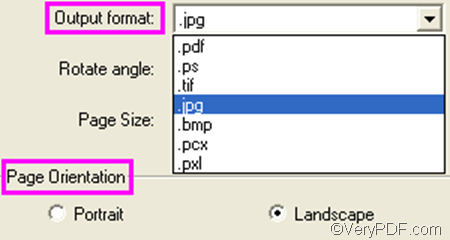 After installing it on your computer, please follow the instruction below to convert PRN to JPG and set page orientation. Firstly, you can double click the icon of VeryPDF PCL Converter on the desktop to run its GUI application. If you are using the registered version, the interface will immediately appear on the desktop. If you are using the trial version, the registration dialog box will pop out, and you need to click Try on it to open the interface of the trial version of VeryPDF PCL Converter. Secondly, to input PRN files, you can drag the PRN files from the dialog box and then drop them into the list box on the interface. Or you can: click the first button Add File(s) under the list box. > In the dialog box that pops out, you should select the files and click Open. To change the order of the PRN files in the list box, please click Move Up or Move Down under the list box. Thirdly, to generate JPG and specify a page orientation, please do as follows: click Setting in the list box to open the dialog box for setting. > Select .jpg from the Output format drop down list. > Select Portrait or Landscape in the Page Orientation group box. > Click OK. If you like, you can also set other options in the dialog box before clicking OK.
Fourthly, click Start on the interface. The Browse for Folder dialog box appears, and you can select a folder for saving the output files and click Ok in this dialog box. Please follow the above four steps to convert PRN to JPG and set page orientation. You can get the result JPG very quickly. If you like VeryPDF PCL Converter, please purchase it. The registered version does not add watermarks on the result files. How to Convert PRN to TIF? Convert pcl to bmp and rotate page via command line? This entry was posted in VeryPDF Blog and tagged prn to jpg, set page orientation. Bookmark the permalink.